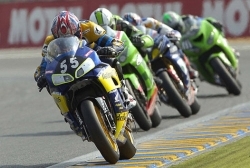 The Le Mans Moto 24 Heures is the the benchmark event in the FIM Endurance World Championship calendar and is confirmed for 20-21 April 2019. The Sarthe endurance classic will be celebrating its 41st anniversary in 2019 and is the second round of the championship after the Bol d'Or. 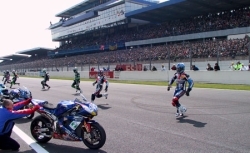 It will mark the restart of international motorbike racing after the winter break. In 2018, 76,000 spectators flocked to the circuit to witness one of the toughest events for riders and their support teams, as well as the bikes, as they complete in excess of 800 laps. The TSR Honda Team triumphed in 2018 completing a massive 843 laps. This event is the ultimate in motorcycle endurance racing. It is a spectacle not to be missed by any motorsport fan. Le Mans is a fine venue for motorsport - close to the UK, fast motorway access, a wide range of channel crossings and a circuit offering great motorsport and Saturday night concerts. Accommodation is often extremely difficult to find in Le Mans. We offer an option in Le Mans which offers both comfort and maximum convenience. Our hotels have been chosen to be within walking distance of the new Le Mans tramway system. The tramway takes you to Antares, where you would alight for the circuit. The Premiere Classe Universite has 69 rooms and is very well located in north-west Le Mans, being only 6 km from the circuit and 3 km from the centre of the town. The tramway stop is approximately 300 metres from the hotel. This will take you into Antares at the circuit and into the centre of town. Single rooms available - please call or e-mail for prices. Camping within the circuit is available with the purchase of at least one general entrance ticket. Trackside near the famous Dunlop Bridge. Only available to campers on a motorbike. Inside the track near to the Porsche Curves (about a 15 minute walk to the start / finish straight) Available to cars and motorbikes. All other camping areas including Houx, Houx Annexe & Blue cannot be reserved and must be paid locally.